Availability: Pre-Order for a Super Fresh Product. Ships in 10 - 14 days. Brief Description: Fall in love with this at-home pore-refining mask: a pore-control booster treatment that absorbs excess oil leaving the skin matte and evenly toned. Minimizes enlarged pores, mattifies, evens complexion & texture, de-ages, and deeply hydrates. Those concerned with oily skin, enlarged pores, uneven skin tone & texture, dehydration, lines and wrinkles. Start your regimen with your ideal Pevonia Cleanser and Lotion/Toner. Next, apply a thin layer of this instant results mask to your face and neck. Leave on for 15 minutes. Remove with cool water. Finish with a mist of Pevonia Lotion/Toner. Or, for boosted results, apply your ideal Pevonia Serum, followed by your ideal Pevonia Cream/Moisturizer. 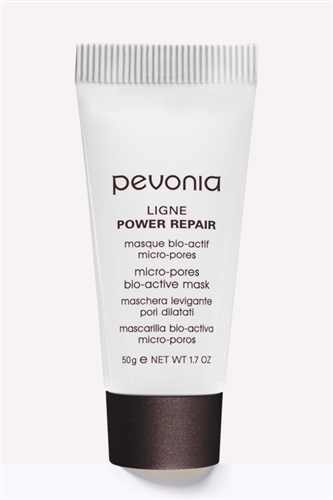 Can be used for multi-masking on target areas, or as an overnight mask treatment once per week. Water (Aqua/Eau), Pseudoalteromonas Ferment Extract, Isopentyldiol, Trifolium Pratense (Clover) Flower Extract, Glycerin, Sodium Hyaluronate, Sodium Carbomer, Phenoxyethanol, Caprylyl Glycol, Ethylhexylglycerin, Hexylene Glycol, Sodium Chloride. Discover the Power of Pore Perfection! Featuring cutting-edge technology and a probiotic peptide extract, this extraordinary treatment works to visibly refine pores, reduce oil production and brighten the complexion! We are not all pore perfect. Pevonia® harnesses the power of two breakthrough bio-actives to work hand in hand with the skin's natural physiology. Micro-Pores™ features a NEW PROBIOTIC INGREDIENT; a groundbreaking peptide that contains skin perfecting amino acids! RED CLOVER EXTRACT Prevents oil build-up, Tightens pores, Evens skin tone.